The Angus L. Macdonald Bridge, completed in 1955, connects Dartmouth and Halifax, Nova Scotia, Canada. The suspension bridge is 762 m long, with a 441m main span and carries about 45,000 vehicles per day. 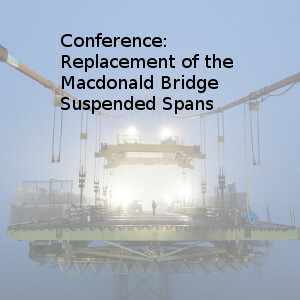 The suspended spans reached the end of its functional life and were replaced segment-by segment during full weekend and evening closures of the bridge, with traffic using the bridge during the weekdays. The last segment was installed February 2017. The new deck segments are fully pre-fabricated, including an initial thin layer of wearing surface, and erected in a way that allows traffic to use the bridge immediately following the replacement of an existing deck segment. The deck segment fabrication began early in 2015 and erection began in late 2015. Concurrently with the replacement of deck segments, the hangers were replaced and the deck was raised to allow for increased shipping clearances.